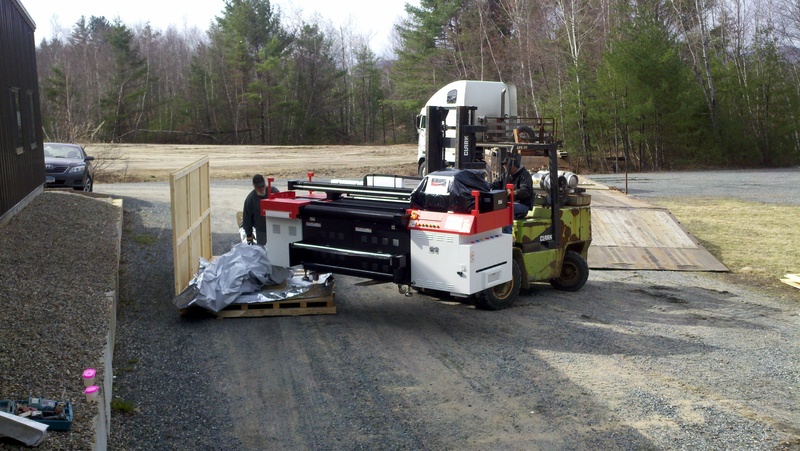 Here’s our new flatbed printer about to be delivered. We’ve been working our existing machine so hard that we decided to buy a second one, this time with twice the speed of the original. This will give us the capacity to produce custom printed wallpaper, store signs, and event banners quickly and even more affordably. We’re really excited to have it up and running! Having a second machine also gives us the redundancy we like to have to be sure your job ships on time. Naturally, we discovered that the machine was three inches wider than our loading dock, which presented a few challenges getting it into the building. Our hat is off to CC&C riggers, a local Plymouth company that brought it in the door. I’d recommend them to anyone! This entry was posted in Flatbed printing and tagged custom printed wallpaper, flatbed UV printing, meeting signs. Bookmark the permalink.